My now 10-year-old daughter is very attentive to the insect population around our house. She spends many hours collecting all sorts of insects and other animals. In the fall of 2013 she brought me a leaf that she thought had a caterpillar of some sort on it. She is well aware that bugs make little houses in leaves and stems and after she realized that these little orange furry things were attached to the leaves she thought there must be a bug living inside of it. She was hoping I could open one up and show here the critter inside. I didn’t know what it was but a quick look at the oak trees in my yard revealed that there were a LOT of them as you can see in the picture below. We have at least 10 large pin oak trees in our yard in addition to a few other in the neighbors. I did a quick scan of the lower branches and then calculated that there must be at least a half a million of these little fuzzy blobs on the leaves in less than an acre of land. Surprisingly, I also have a large white oak tree right next to a heavily infested pin oak tree and I have yet to find a single one on the white oak tree. What I found strange about these galls the first time that I saw them was that at the time we had lived in our current home for a bit over a year and I had no memory of having seen these on our trees that first year. I don’t know how I would have missed them and yet in 2013 the rees were covered with these galls. But what are they? A bit of searching revealed that they are a type of gall produced by a gall wasp. Most likely they are produced by the tiny gall wasp Callirhytis furva although there are a couple of other possible wasp species that produce galls similar to those we are seeing on our trees. Below are a few more pictures and a description what this gall wasp is doing. The picture above and below show a few of these galls a bit closer. You can see that they are found along the main veins of the leaves to which they are attached. A very small wasp–barely visible to the eye–implants an egg into the growing leaf which then turns into a larva which then entices the pin oak tree to grow these galls which the larva then inhabit and use for protection while they mature into adults. Although the galls look nothing like the leaves or any other part of the tree they are made of plant tissues from the tree. Yes, the hairs and colors are plant tissue and not from an animal. Fuzzy gall wasp galls on leaves. About three weeks later in early September the galls began to turn brown after having been a bright orangish-red color. Then they started to detach from the leaves and drop to the ground. The galls seem to have matured and before the leaves change and fall to the ground to rot these galls detach themselves and fall to the ground where they will rest until the larva matures into an adult wasp and emerge from its protective home. 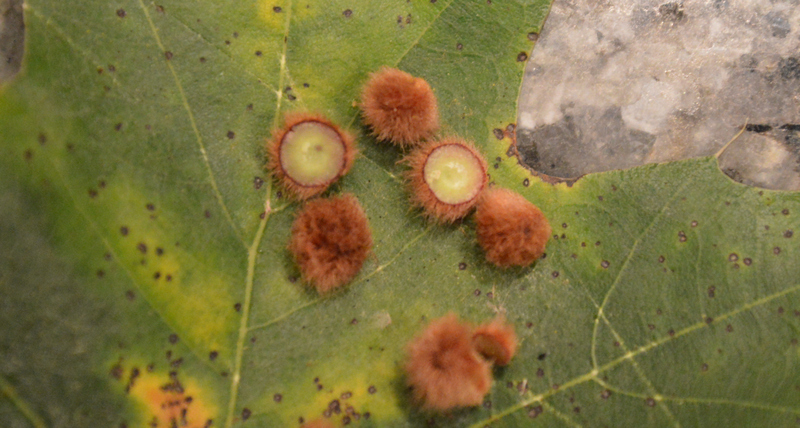 I plucked some galls off of a leaf and cut them open. They were quite solid. The small dot in the center is probably the tiny larva which is surrounded by thick plant tissues and a hairy exterior. Over the next year to two years the larva will eat away at the tissue in the gall using that energy to go through its developmental stages to eventually produce an adult gall wasp. 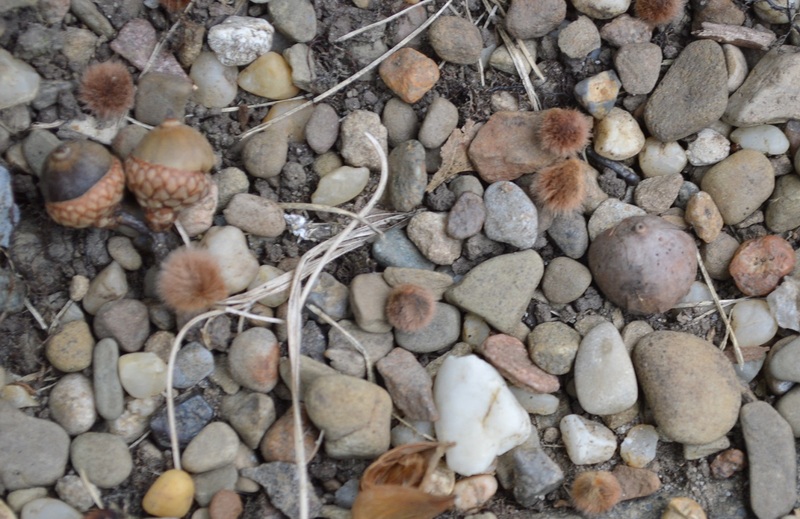 Above is a picture of some of the galls on the ground not long after I first noticed the galls. Not long after that the ground is just littered with these little brown fuzzy balls. From my reading I have found that it may take two years for the larva to mature to an adult and emerge from these little galls. I collected some and put them in a container which I will keep in my shed to see if they will emerge next year or the year after. 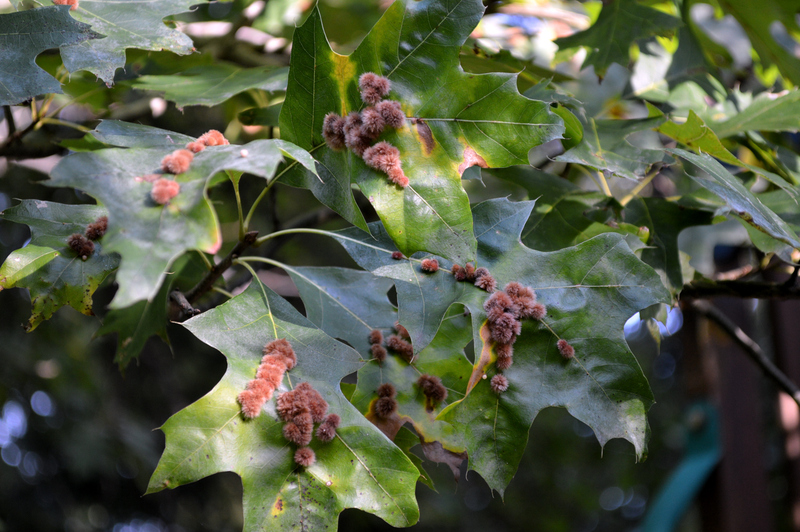 Interestingly, in researching these gall wasps I found reports from northeastern Ohio of these galls on oak trees from 2007, 2009 and 2011 with the latter two being reported from not more than 20 miles from where I live. The odd years suggest that it is a two-year cycle and this is why I did not see any of these galls on my trees last year. Well, I guess we had millions of little wasps flying around that weren’t with us last summer but we didn’t’ seem to notice. So next year I am expecting that I won’t see them but I am sure that my daughter will be watching each summer to see what shows up next. A 2014 update: When I wrote about these galls in 2013 I suggested that this was a two-year cycle and so I would predict that there would be no galls in 2014. Turns out my conjecture was right. I’ve looked and looked and none of my oaks have any galls this year. Next year will be the gall year. 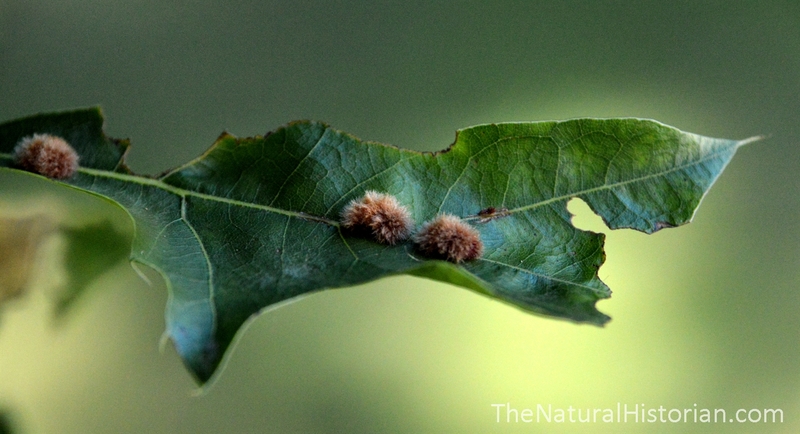 August 2015 update: Around August 1st I saw the first small fuzzy galls on the same oak trees as they were on in 2013! Two weeks later we have tens of thousands of them and they are growing fast. They haven’t reached the size they did in 2013 yet but I am sure they will in the next few weeks. Below are some pictures I took on August 22, 2015 of the galls on the same two trees as those taken above. 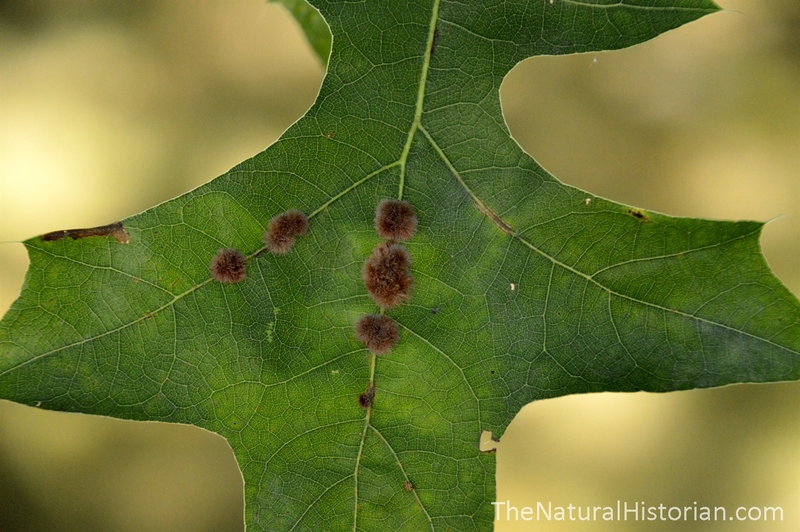 August 2017 update: Like clockwork we observed thousands of galls appear on the tops of the leaves of the same oaks trees in the yard. The previous year (2016) we didn’t observe any so they are following the every-other-year pattern. Fall 2018 update: No galls on the oak trees this fall. I expect we they will be back next year. 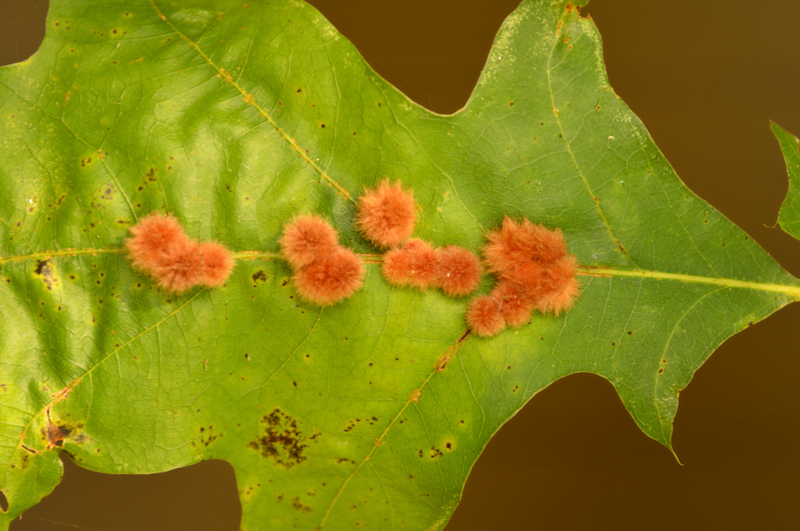 will there orange looking fuzzy galls kill my oak trees? I live in Central Florida, I have just seen them on our trees for the first time here. Never paid much attention to the trees before. But now that my job requires me to be outside more, I am more in tuned with what is going on outside. I live in central florida, I am also very observant when it comes to nature, as I was an avid bug collector growing up. Not only have I never seen this in florida the past 12yrs, but neither in Ohio growing up, until today when I saw them in my Live Oak tree. But not in the touching hickory or citrus trees, I did see evidence of millions of egg sacks on the hickory leaves that were brown and brittle, dead looking, and did not have the brown fuzzy surrounding. Maybe they didn’t take to the hickory? 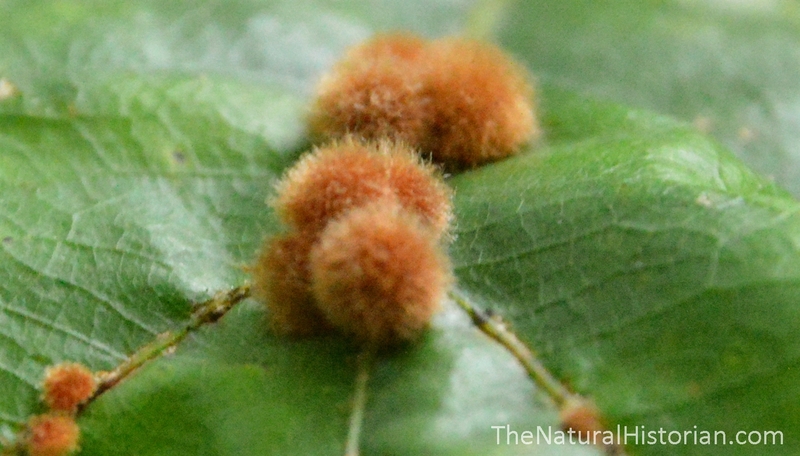 I googled “brown fuzzy balls in oak tree” bingo, great post! I will be revisiting this post and doing some back yard research. Very interesting. I really hadn’t noticed them here in Ohio until two years ago but then we had moved across town so maybe these wasps can be very localized. We had none this year suggesting they are on a two year life cycle so I will be watching closely this coming year to see if they show up again. FABULOUS! Thank you for all your research and enlightening me and my family. Thank you, i was recently cutting down trees and found some of these and now I know what they are. I live in Northern Florida Palm Coast near Daytona Beach and it obviously is not an Oak tree it is on but apparently it is not particular to the tree itself. I have photos to share if you like. Are they ok to collect? I too have 6-3&2 yr olds that love nature. Are we safe to place them on a jar for looking at? Hi Lea, no problem collecting them. There are wasp larvae inside which are no big deal. Even if there were wasps they are stingless and wouldn’t harm anyone. I live in the Coastal SC area and we have been overrun with these galls this year. Nobody seemed to know what they were, not even my tree guy-now I do and he does also. Wow, so many stories from all over the eastern US of galls this year. Seems it was a banner year all around. Yours are probably a different species of wasp so it isn’t just that one wasp did well. Maybe the mild summer was good for lots of insects. It will be interesting to see if the huge numbers this year result in larger numbers in future years or if this was just the perfect storm of conditions for gall wasps. I noticed them a few weeks ago on my oaks on the Central Coast of California. I thought my oak trees had grown flowers which is strange given that I’ve had these trees about 20 years and have never seen anything like them. They are red and fall off the leaf if touched even slightly. They seem to fade to beige after a while. Based on your pictures, I suspect it is some form of what you are talking about here — hopefully they will not damage the tree and don’t sting since there are a lot of them. Thanks for your excellent information. Yes but will they kill my tree? I have a tiny little pib oak about 3 foot tall and they are all over it. The leaves are turning brown and I just planted it in May. I grew this in a por until it got big enough to plant. If they are the same thing that I have here it is not likely. If the galls appeared in the last month then the leaves have already done most of their job for the plant and any damage to them now doesn’t make much of a difference. The tree is going to shed those bad leaves for the winter and then get new ones next year. The leaves on a typical oak have already done enough making sugar from the sun by August that any damage to them will be almost meaningless. Now in the case of a newer tree it may slow its grown down a bit. If you whole leaf is turning brown that might be something different and not related to the insect galls. Not sure what would cause that. I have just noticed these galls on the leaves of a pin oak yesterday for the first time while walking along the Montour Trail in suburban Pittsburgh. Thanks for the informative posting. Thank you so much for this… I found them on a little Oak tree growing in my year. they remind me of “tribbles” from Star Trek. Interesting information … thank you for putting it together! I have lived in my home for 19 years and this is the first year I have ever seen these on my oak tree. I noticed today they are falling off all over the deck and yard…what happens to them after they fall off and mature? More wasp’s? I’m allergic to bees and wasp’s so I am probably paranoid. Thanks for the great article. I live in Central Ohio. Hi, thanks for the feedback. Regarding your questions. When they fall off, the grub inside the gall will overwinter in the gall eating from the inside out. In fact, it will probably live in there for almost two years before coming out as a small wasp. Don’t worry about these wasps. They are tiny (just a couple of millimeters in length) and so are barely visible and they are only interested in getting their eggs into a new leaf. They are called stingless wasps because they have no stinger. You will almost certainly never know they are even in your yard until the galls how back up on the trees. It does seem their populations are growing as many people are noticing these for the fist time in their yards. There is probably no relationship between acorn numbers and the galls. Acorns very quite a bit year to year in oaks. They generally cycle from very low numbers to big years. Thank you as well for the information! I have lived in my home for 4 years in Martinsville, Indiana and just noticed the “fuzzy things” on the leaves of my pin oak tree a couple of weeks ago. My son and I were looking at them again this evening and I had to know what they were! Your article/post was the first to come up and was very informative. I’m amazed at how widespread they are! 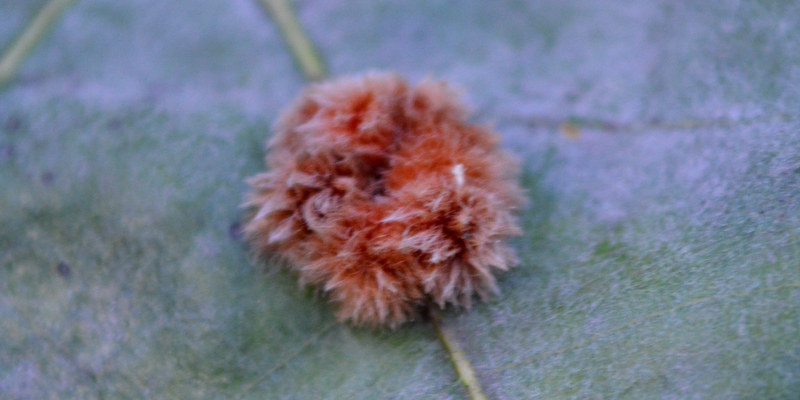 I live in southwest Wisconsin in a heavily wooded area and we have millions of these fuzzy things everywhere in our yard. Im glad to finally know what they are! I have lived in this area for 15 years and this year was the first year I have ever seen them here. Thank you for this info and the timely updates. Much appreciated! I see these fuzzy balls dropping from my neighbor’s oak tree this year; some are also still attached to dropped leaves. I live in central MD, by the way. I live in central Ohio and have seen the same thing. Nice to know what they are. I’ve been calling them “tiny tribbles”. Ha, yeah tribbles is a great description. So my driveway is not covered with tribbles as they are dropping of the trees rapidly now. They need to detach from the leaves before the tree begins to pull the nutrients from the leaves before dropping them. I have been wondering what these things are! I live in Cincinnati OH and they are everywhere this year, I sweep our porch every morning and by afternoon it is COVERED! I have not seen this many before, and never knew what they were. Interesting! Thank you! These are exaclty what I have this year in MO. I appreciate the decently detailed explanation of what they are and how they will come and go. VERY happy to hear my tree will be okay. I live in northern Ohio close to the lake,after two days of high winds,our deck was covered with oak leaves with these yellow balls all over the leaves.I like your daughter,thought they looked like some type of caterpillar.Thanks for the information you have provided. I live in one of the Northwestern suburb towns of Washington DC ans found these red-yellowish stuff on my oak tree leaves. We went to local Home Depot store and was told they are fungus on the oak tree leave, and this oak tree disease needs to be treated with dormant oil. Is this information correct? My mom has an oak in her yard with these galls but they are more beige/yellow than orange/red/brown. Everyone in her neighborhood has been wondering what they are. This is the first year of the galls in her tree and the only oak tree in her neighborhood to have them. She lives in Marengo County, Alabama. Saw them for the first time in my yard in Birmingham, AL. Their “habit” fit what you said. I wonder if these are related in any way to the much larger oak galls that we used to play with for “races” in our local creek. The ones I remember were about two inches in diameter! “Tiny Tribbles, on the ground, tan and fuzzy, all around”… I suspect the gall wasp of being quite an affid eater as the years with Tribbles seems to be the years with low affid infestation on my mandovilla Plants! Great post, thank you. TOO COOL! THANK YOU! :) I saw the first one I have ever seen on a fallen leaf two days ago. I am in Birmingham, AL and have lived here 20 years. found a bunch in my yard. this is terrifying, thank you. Did you just lead blow them out of your yard? How did you get rid of them? There is no way to get rid of them. There are hundreds of thousands of them and aside from massive spraying of pesticides on the trees it would be difficult to eradicate and they would just come back from other place in the neighborhood in two years anyway. They aren’t that damaging to the tree and you won’t notice the wasps because they are so tiny and don’t bother humans so there isn’t much concern about trying to eliminate them. Thanks for this great information. We have lived in our house with the same live oak tree since 2003, and have never these fuzzy guys before. Would the stress of a hurricane 1 year ago contribute to the appearance of the wasps? Thanks. I think it is unlikely any stress on the trees would make them any more susceptible to the wasps. They are able to use very healthy trees and those trees aren’t really hurt much by them. What has happened is the wasps seem to be spreading to new areas and so they have moved into your area. It is possible that winds brought them to the area and now they are taking up residence. It is unlikely that there is anyone to get rid of them now but they are tiny and not going to bother people. Thank you for your post and your annual updates! We just moved from the east coast to the Phoenix area so are just learning about desert plants. 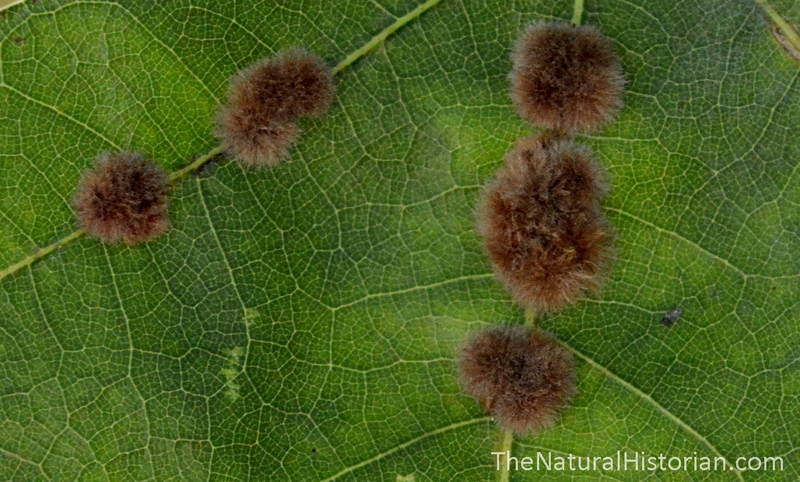 We have 3 desert oak trees that are COVERED with these little galls. Like you said – a half a million! You didn’t mention how many wasps actually emerge and if it is a problem. We have a terrible mosquito problem here in the desert (who knew!) and I’m not looking forward to a wasp problem. Thanks so much! Should just be one wasp per gall. I’ve never noticed any wasps and I’ve looked for them so they must not spend much time right at ground level. Just what I wanted to hear! Thanks for your insights!! I’ve never seen them in such great numbers which spurred my interest, thx for the info. Old oaks in St. Pete. My husband ran in to tell me he found these fuzzy balls that our four year old was squishing. He said they either had red or yellow stuff ooze out of them and had idea what they were. We live in Southwestern Georgia and have never seen them before. Thanks for making an outstanding blog and also all the other commenters too. I was really shocked to see how far and wide other people have been seeing and commenting on them too. Thanks again for all the information. Did the gall ever hatch? I wish I knew. I had my collection of galls in the garage in a plastic container but couldn’t find it in the spring. I suspect one of my kids knocked it over or used the container for something. I will have to try again this year.